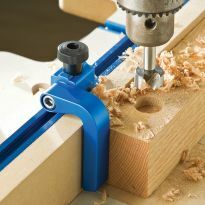 At only 3-1/2'' long, this compact version of our popular Deluxe Hold-Down Clamp is ideal for smaller work surfaces, such as benchtop router tables and shop-made jigs. Non-marring rubber tips are ideal for working with soft woods, pre-finished panels, or anything that's already been prep sanded. 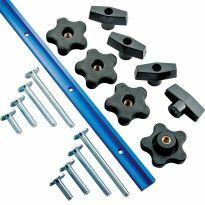 Hold-down includes a 4-star knob, washer and a 5/16" x 3" T-bolt designed to fit into T-tracks on drill presses, router tables and more. Haven't had a chance to use them, but was anticipating using them.. Fits into smaller area than its big brother. Works well. This tool performs very well for what it was designed for. Love them. Just the right size for my projects. Work just fine, very happy with them. Really holds down anything I am drilling nice a tight. Just received the clamps, high quality and I will surely purchase more. These are very nice and work great on my Cnc table. Installed two of them on my crosscut sled for my table saw. It is as advertised. It is plain, simple and well made. I have two of these minis that I mounted on a homemade small table saw crosscut sled, attached to a t-track. They work very well, but I honestly have not used them in that application except to try them, as I handhold even the smallest of pieces against the fence with my fingers. They are perfectly out of the way at the top of the sled and are there should I need them. These holds are great.. especially for that price! They are quite small, but the hold strength is more than adequate. I would purchase these holds again if I ever need more. I plan to purchase some of the larger holds they provide, as well, based off my experience with these small ones. The large size makes it flexible. Great mini hold-diwn for my small drill-press...cheaper than a mini drill-press vise! Good product, fast delivery, at a fair price. These hold downs are very nice and convenient. Need to order some more. I love them to hold down wood when sanding ,routeing and find all kinds of uses. I use them on my router table, drill press , and I made a board with T track to hold wood to work on and they fit all T track accessories. Overall a quality product. I had to add a 1" washer, lock washer and nut to the T-bolt head. Without the washer the T-bolt head is too small for the slots in my drill press table. Nice type of clamp sized and designed to work with T track . I like both the large and small versions. Great quality and easy to adjust. Holds very securely. Good price. Great product use them all of the time! Safe to use with CNC because they are not made of a ferrous metal. Bought to work with the small sled and lock down pieces being cut. 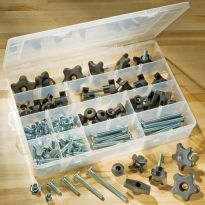 I purchased these to use on a CNC Router, Work benches, Router and a few custom projects. These clamps work great and easy to change the 5/16th configuration for use on a 1/4" setup. I will be buying more as you can never have enough clamps, and these are a great addition to my shop. 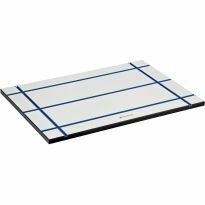 Great for holding down stuff up to 1.25” thick. If you try to hold down wood that’s over 1.25” thick, the clamp will be sitting at such a steep angle that it doesn’t hold well. It’s a great space saver on the CNC table. Excellent size won’t get in the way. 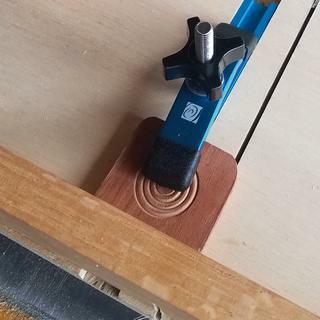 I just built a crosscut sled with a track channel and this clamp, and it works perfectly for holding small door trim rosette pieces while cutting them to finished size. 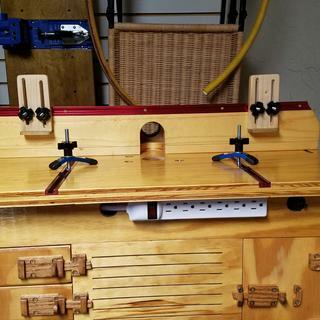 Used on homemade router table and worked out excellent, have superior holding strength and versatile enough for many different types of wood. Perfect for drill press table! 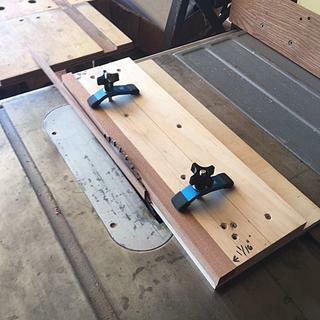 The small hold downs worked perfectly for holding down stock on a table saw sled with one runner while only sitting on the edge of the stock leaving plenty of room so the saw blade would not touch the hold downs. Works well. I haven’t had any work pieces slip yet. Hold down small parts on cross cut sled. Wish I had gotten one sooner. I used these on our CNC machine. They work as expected and do not mar the wood. Solid choice, reasonably priced. I have a couple of jigs that these stay permanently attached to, and get used almost daily. High quality, do what they are supposed to do. Nothing to tinker with to get them to work correctly. I use it with shop fixture and on my drill press to hold down work, it works well and is sturdy. I like it. Great clamps for my collection! They worked great for small wood projects. Definitely need this for the small parts sled. Work great on my jigs and drill press table top. This clamp is versatile enough to be used at my drill press. Small foot print with big holding capacity. Needed it for a project. 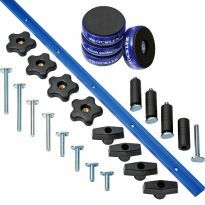 Have used Rockler clamping parts before and like their fit and strength. First off, the quality! second - cost! These are jim dandy hold down clamps ... I plan on using them on my leg tapering jig to hold the piece securely in place while sawing. Add to small parts cut off jig. Making some jigs for my table saw. After researching many various devices to secure a drill press vise, I concluded this unit from Rockler was the best choice in both versatility and value. Perfect to hold small pieces in a jig or sled. Price is good and I have purchased items before from this Company and was satisfied. Building a fence for new table saw. Made a new drill press table for a place I do volunteer work. Liked these clamps on my own drill press and have been happy with Rockler products in general. Fast delivery. Reasonable prices. I already have the track system but did not have the hold down clamps. Multi-jig use. 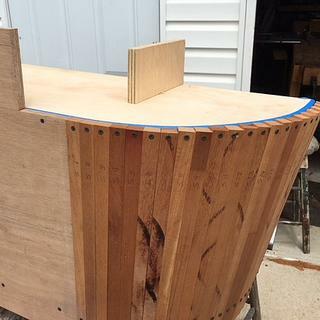 Table saw and router table. Saw them in a youtube wood working video and they looked like they'd work for my needs as well. smaller size and the sale price !! Changing out my clamping system for my CNC. Also there was a price reduction. hold down stuff? trick question? What are the dimensions of the T-part of the bolts? BEST ANSWER: THe "T" section is too wide to fit into the track. It has to be ground down to fit into the track. Also ordered extra "T" bolts tand they too are too wide to fit into the track. I have different sizes, all purchased from Rockler. I’d say the smaller ones are over two inches on the T.
Will these work with the CNC Piranha XL? BEST ANSWER: Yes, they work well with the Piranha series of CNCs. Yes, I use them on the Piranha FX for more clearance and flixibility. Will these work to hold down a 16" scroll saw on a bench top? BEST ANSWER: If you have tracks for the T bolts to fit into, and I am not shure how thick the base is or if it has an edge on the bottom of scroll saw to clamp onto, you could get the tracks and either clamp the track to you bench or screw it to your bench. hope this was helpful. For my scroll saw, I directly mounted it to a box filled with sand inside to decrease vibration. These clamps might be a bit small for gripping a box like that, but I think for mounting a saw they'd be fine. My guess is that they would work fine. You could use several to get the job done. 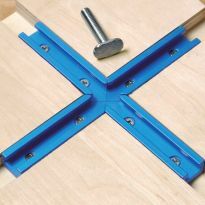 I use these clamps to hold down my Kreg pocket screw hole device. Also, the larger hold downs might be even more effective. No problem, as long as each of the critical points of table contact are firmly secured with a hold down. What are the approximate dimensions of the clamp? 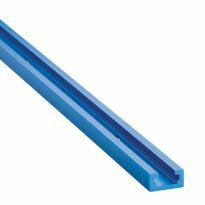 BEST ANSWER: The blue clamp part is 3-3/4" long. Nice for small parts and a good addition to the larger clamps. Get a pair, at least. I'm not in my shop right now, but its about 3.5 inches by 1 inch... I am buying more myself! They measure 4" long by 1" wide, and has a 3" bolt. 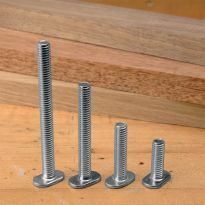 will these t bolts fit a 5/8" slot on a drill press? Yes, they fit on my drill press but are "sloppy". Is this a 5/16 - 18 or 24 pitch thread? BEST ANSWER: Matthew, they are 18 pitch. Just ran out and double checked with a thread guage to be sure. Will this t bolt fit in a 20 series 8020 extrusion? 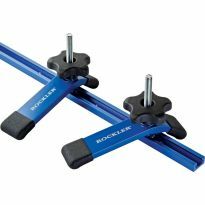 BEST ANSWER: Sorry can't help here Iam not familiar with the 20 series 8020 extrusion, the folks at Rockler can help answer that. 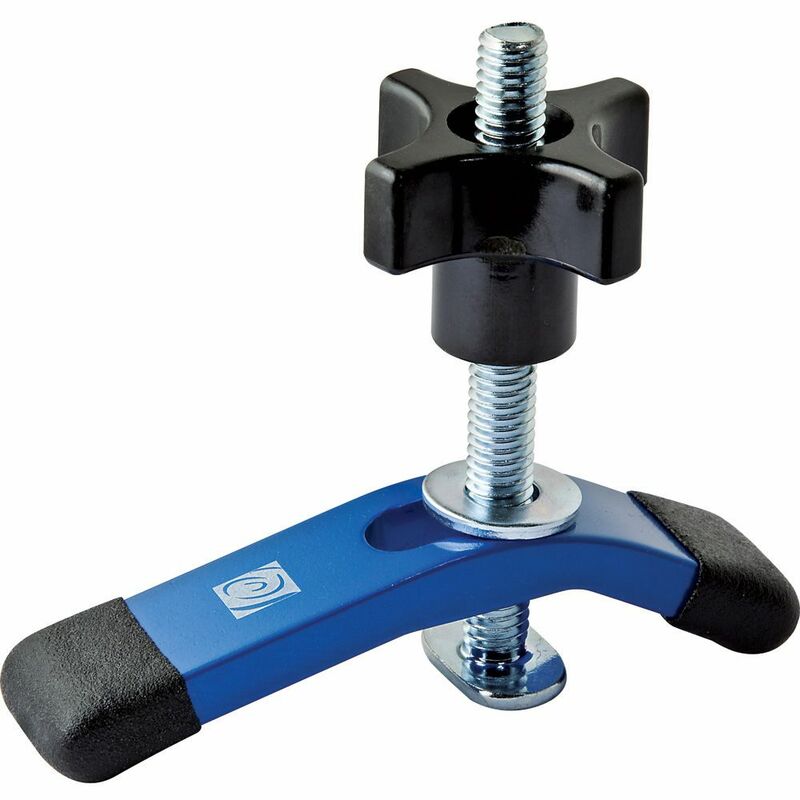 How tall is the 5 star knob on this clamp? I want to use it in my drill press table, but dont want my circle cutter bar to hit it. Mine measures 1.032 inches or 1 and 1/32 inches tall. Will this bolt work with a 0.5" dia 14° dovetail groove (0.375" depth)? BEST ANSWER: As long as the opening is 5/16" it should work. They were made for a "T" slot but dovetail could work. Use a T-slot cutter. Dove-tail slot will not have the clamping strength to yield good results. Can I get replacement tips for these? Mine are wore out. BEST ANSWER: I'm sorry, these tips are applied by dipping the ends into a coating. You could achieve much the same results by using a similar product, such as Plasti Dip.